The holiday season is upon us and Christmas is right around the corner! As you get your home ready for holiday entertaining this year, don’t forget to spruce up your walls. Here are 6 Super Easy (and Super Festive!) DIY Holiday Wall Art Ideas that you can make IN A DAY. And did I run around to a million different stores to gather materials? No way! This busy mom was looking for something simple and fun! I sourced everything I needed for these projects from THE CONTAINER STORE. Okay, I know what you are thinking! The Container Store?? But anyone who loves The Container Store like I do knows that it is the place to go for wrapping paper and other gift wrapping essentials. And let’s be honest, it’s also the place I head to when I need to organize my life to maintain sanity (which is usually the case right around this time of the year!). So, while I was there thinking about wrapping paper and getting things organized, I was also completely inspired. I used readymade frames that I already had on hand (I love these because I can pop art in and out easily throughout the year). 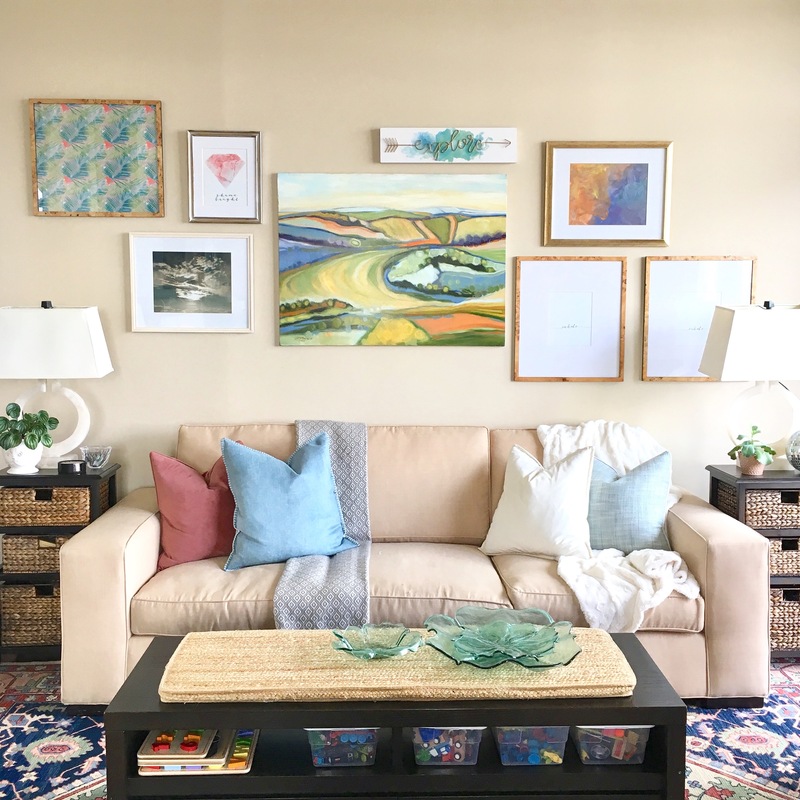 Need inexpensive framing ideas? Click HERE to see where I get the best readymade frames! I removed the glass fronts from the frames and carefully stored them away. For these art projects, I wanted to highlight the 3-dimensionality of each piece! I gift wrapped the matting that came with each frame to create a sturdy backdrop. No matting? Just cut a piece of foam board or poster board down to size and wrap that instead. I used regular Elmer’s glue to adhere all of the embellishments because it’s what I had on hand (nothing fancy!). However, may I recommend using the white kind that dries clear? Not, hypothetically speaking, the red sparkly kind that you may have quickly grabbed from your kiddo’s art box! Click on the individual images beneath each project for product details. How sweet are these tiny sleds??? This wrapping paper is so SPARKLY and GLAM in person! This would be gorgeous wrap for a wedding gift! Tiny decorated wreaths make the perfect Christmas tree! Just flip the tree stump over so that the “To” and “From” are not visible. This project might be my favorite! These tiny reindeer tags came in packages of 3. Just the right amount to pull Santa’s sleigh. I had an extra red gem in our art supplies at home, so I was able to give Rudolph his red nose! Poinsettias feel so festive this time of year! And these tiny beauties are STICKERS!! How easy is that? Just peel and add as desired to add some pops of color to this gorgeous wrapping paper! I couldn’t cover up this wrapping paper! It was just too cute. So instead I anchored it with a beautiful bow (stuck to the frame itself with super sticky tape). But be warned: this ribbon is GLITTERY! You will sparkle for a few hours after this project! Happy gift wrapping, crafting, and art making! Which one is your favorite? Let me know in the comments below!